The last time this Out of Joint production was performed in London it was in Dr Johnson’s house in Gough Square, in the garret where he worked on his dictionary propped in his three-legged chair. In terms of intimacy and atmosphere it was always going to be difficult venue to equal, and it’s certainly not matched by the bland, boxy basement space of the Arts Theatre, which has a stale, sap-sucking quality all of its own. Cribbed from Boswell’s Life of Johnson with a smattering from his London journals as well as from A Journal of a Tour to the Hebrides, this is potted Johnson, hopping between the key events in the life of the Lichfield-born lexicographer, essayist, clubman and failed dramatist. Johnson describes how he was taken to be touched by Queen Anne as a child to cure his scrofula; he talks about his curious marriage to Tetty, some twenty years his senior and the object of ridicule of many of Johnson’s friends, including his one-time student David Garrick; he dances around the various controversies surrounding his pension and bemoans the lack of trees in Scotland. A familiar picture comes together of a man who was both hugely sociable, who found company and human connection absolutely fundamental to his life, but was also prone to melancholy, perennially black-dogged; a man of appetite, tics and habits, he could show great restraint but could not be moderate (he was known to drink 14 cups of tea in one sitting); he was also, of course, a man of great wit and learning, and Johnson’s aphorisms and definitions provide the largest laughs, with critics “a species of dung beetle” and the Scottish coming in for a particular kicking, and all the best known lines duly trotted out. Boswell does his (inevitable) bit, acting as friend, antagonist, interrogator, as well as taking some predictable pleasure in recounting his amorous activities “in armour” on Westminster Bridge and his resultant bouts of venereal disease. 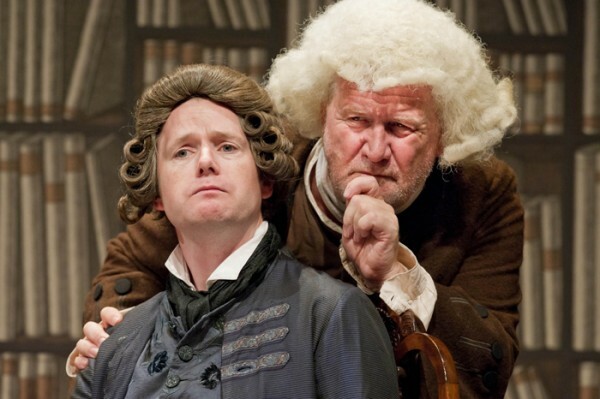 The role of Boswell, along with the majority of the minor characters – King George III, a preening Sir Joshua Reynolds – were originally played by co-adaptor Russell Barr, but illness has forced him to pull out of the London run and so these parts are played – ably despite having to step in at such short notice – by Luke Griffin. Barr’s Jack Russell, Katie, who represented Johnson’s ageing, finicky cat, Hodge, in the original run is also no longer present. The piece consists mainly of the two men either bickering or each relating their own strand of the story, speaking in turns. As Johnson, Ian Redford both looks and sounds the part; in his fizzy white wig, he closely resembles portraits of the man and he injects a measure of pathos into his recollections, a sense of emotional isolation, without over-egging things. A puzzling decision has been made to cast Trudie Styler as Hester Thrale, brewer’s wife, society hostess and the object of Johnson’s affections. Her eventual marriage to an Italian music master is presented as one of the major upsets of his life, but while Styler’s performance is fine, her appearance in the last twenty minutes does rather disrupt the dynamic of what has up until then been an engaging, if overly talky and rather flatly staged, two-hander.